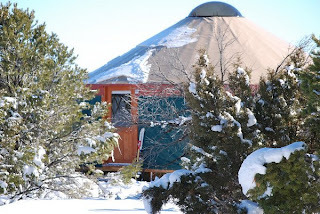 THE YURT: Hello, I'm "The Yurt". I'm 24 foot across, 14 foot tall, I consider myself spacious, yet cozy..... rustic, yet luxurious..... I love the wide open country, snow capped mountains, and enjoy entertaining company. I consider myself a place for you to Re-fuel, Re-vive, Re-group, Re-lax, and Re-search your next day's adventure. If you're interested in getting to know me better, send me a message. If you've already experienced my magic, please blog about me, so others can read about your experiences, and start planning their own "Yurtcation". So.....if all this talk makes you want to get to know me a little better, please read on. Don't be shy, I enjoy the attention. My Profile: As I've said before, I'm pretty hefty, at 24ft diameter (456 sq. ft) with 8ft walls and a 14 ft ceiling. I can comfortably accommodate 4-6 people, or up to 8 people if you get creative and bring your own camp pads and sleeping bags. I have a queen sized bed, a double futon, a single bed couch and a single cot. I'm anchored on top of a round elevated deck, with tongue and groove douglas fir flooring. The floor, walls and ceiling are all insulated to keep your toes warm, and morale high. The structure of my walls are lattice and sheltered by a ballistic nylon outer fabric. My roof comes together at a compression ring which is the strength and stability of my entire being. At the center of the compression ring is a clear dome, to create ventilation and provide you with a unique view point. My ancestors were originally, and still are, used by Mongolian nomadic herdsman, however I've fallen victim to "modernization" over the generations, and no longer need to wear Yak hides. I consider myself "eco-conscious" these days, and try to make an effort to only purchase recycled, enviro-friendly, or sustainable items for myself. I am also dedicated to staying "off-the-grid", using the sun to give me energy, and the earth to compost waste.